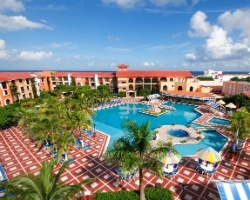 This gorgeous Mexican-style resort is one mile away from the newly renovated center square. *Hotel Cozumel and Resort* is close to the shopping district, local restaurants and bars and is just minutes from the colorful and abundant coral reefs that have made Cozumel one of the world’s top snorkeling and diving destinations. 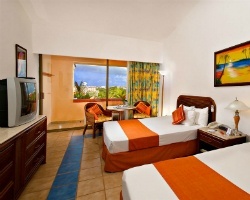 The resort features air conditioned rooms and suites in 3-storey buildings. Each unit is decorated in a contemporary style with bright Mexican fabrics, and all the amenities to make your stay comfortable. Annual floating week! Not far from the beautiful blue waters of Mexico! Buyer May Receive A Title Fee Credit, Inquire For Details!